Sometimes… not always… technology can be our friend. 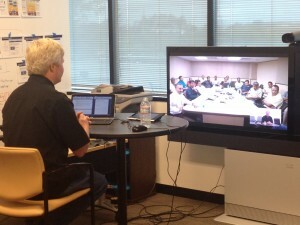 The photo above shows me facilitating a 90-minute event with a team in Chennai, India, via our Cisco Tandberg high-def video-conferencing system. As you can see, the clarity of the video is pretty spectacular. I can watch someone scratch their nose in India, and they can watch me blink. It’s pretty damn close to being in the room and allows us to the kind of ‘just-in-time’ learning that wouldn’t have been possible just a few years ago. Now, I certainly don’t recommend doing all training or facilitation this way. A session is less than 2 hours long. The facilitator/teacher doesn’t need to look over a students shoulder. There is already an established relationship between the facilitator and the participants. I didn’t need to individually coach. I know this team really well. We’ve worked in person more than a dozen times. Virtual training or facilitation is perfect for reinforcement, ‘aftercare’, case-study method, or Q&A. Have you done any virtual facilitation, coaching, or training? What’s worked? What hasn’t worked?